Incredible and at the same time makes me amazed when saw the artwork of a student of Jakarta Arts Institute (Institut Kesenian Jakarta/IKJ). 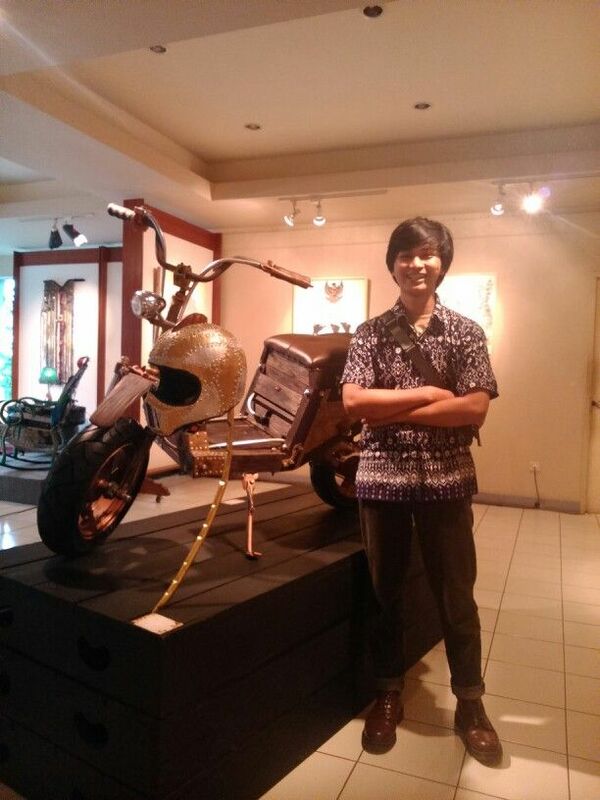 This unique artwork was made by Anas Rosyid, in order to fulfill the final project to complete his study in the Department of Wood Craft (Kriya Kayu), Faculty of Art and Design in IKJ. Keep in mind if he was also a motorcycle enthusiast, especially scooters. The unique scooter is built of the base of the CPI Hussar scooter with 2-stroke engine which has a capacity of 100 cc. According to Anas, because he have hobbies of scooter and wants to create a scooters of wood with a little combination of bamboo, and the look of wooden scooter is a combination of several vintage scooter design. 'I combines the scooter designs from 1901 to 1940," he said. Then he went on to explain, "Scooter of 1901 has many cute designs. 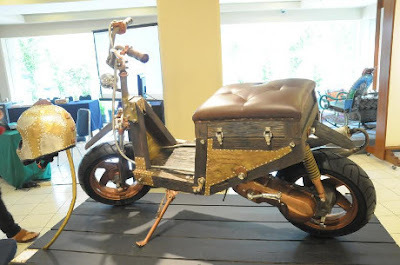 By taking the unique things of scooter designs from 1901 to 1940, starting from the engine, front and rear rim, forks and shock absorbers. And the rest is improvised by my own". This scooter looks old school with a combination of natural wood and gold color rather dark brown. The seat is made a box-shaped similar to an old crate or classic suitcase. In the front, its headlights used was an old bicycle light. On the wheels, he used five-spokes racing wheel. 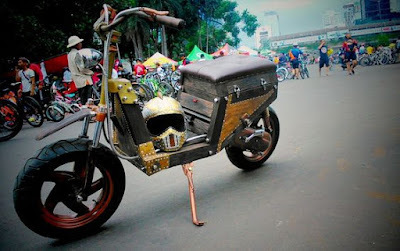 In addition he is also designing and modifying the helmet as a partner of this unique scooter. The type of wood which used by Anas is nyatoh and pine wood. Nyatoh wood applied as the frame of scooter. According to Anas, this kind of wood is considered strong while used for the scooter frame. While the pine wood used in some parts that do not carry the load so that the weight of the scooter does not become heavy.